Nur Fazura took home the Best Actress Award at the 27th Malaysian Film Festival Awards, while the Best Actor award goes to Lee Sai Peng. 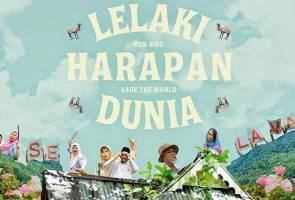 KUALA LUMPUR: Lelaki Harapan Dunia took home the coveted Best Film award at the 27th Malaysia Film Festival Awards at the Kuala Lumpur Convention Centre on Saturday. Raykarl Iskandar), Best Original Story and Best Art Design. The comedy drama film tells the story of several unfortunate incidents taking place at a Malay village, which led to misunderstandings, false accusations and chaos. Meanwhile, actress Nur Fazura took home the Best Actress Award for her role in Manisnya Cinta Di Cappadocia. Meanwhile, Lee Sai Peng - who played the lead in The Journey begged the Best Actor category. The Journey tells the story of Uncle Chuan (Lee Sai Peng), a conservative father with a rigid set of rules. The festival, held at the Kuala Lumpur Convention Centre was hosted by comedian and comedienne, Nabil and Sherry Alhadad. The two-and-a-half hour show also saw performances by Misha Omar, Najwa Mahiaddin, Joe Flizzow and Sonar One. Special Jury Award: "The Great Lion"
Special Jury Award: "Amir & Loqman Pergi Ke Laut"
Special Jury Award: "Terbaik dari Langit"